Report of Valiitha Direnni, Blades Agent assigned to the Imperial Province of Summerset regarding her informal investigation into the murder of Eranwen, Crown Princess of Shimmerene. Official investigations have been carried out by the Shimmerene authorities and the High King’s Justiciars, and the blame affixed to a local terrorist group called The Beautiful. I’ve previously reported this group’s failed and frankly amateur attack on the Crystal Tower. If this is their work, it will be their most successful operation to date. I have affixed a copy of the Justiciars’ report to this document. Let me stress I have no reason to distrust these investigators’ conclusions but since the case involves the highest ranking nobles of Summerset, an outside perspective is clearly needed. Eranwen was sixty-four years of age, the first child of King Teliantar and his wife Estindil. Eranwen had two younger brothers: Morandur, forty-three (now heir to his father), and Andanyon, thirty-eight. 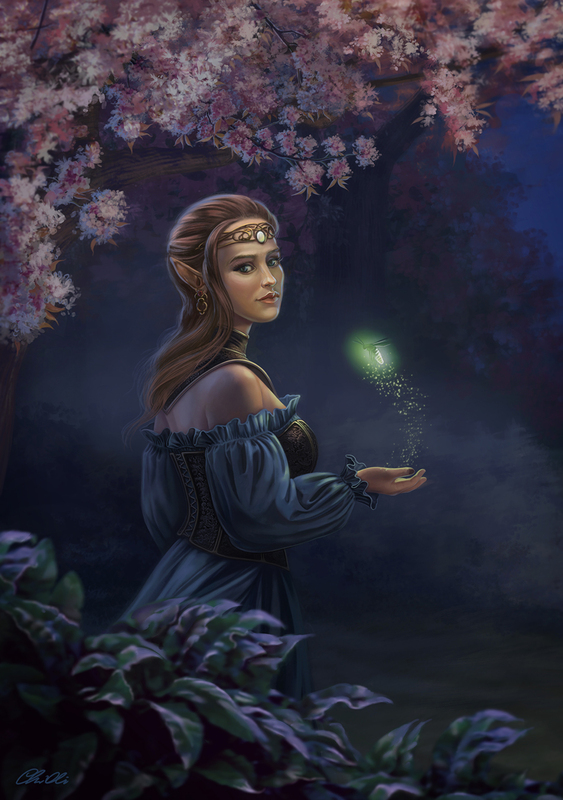 At the time of her death, Eranwen was preparing for her wedding to Prince Meraedil, a cousin of the High King of Alinor. The princess’ murder is a clear set-back for Imperial interests in Summerset. Eranwen was a voice for unity within the Empire. Eighteen years ago, she was a key figure in negotiating peace with Valenwood after the War of the Blue Divide, a war which we have good reason to believe she privately opposed. Her younger brothers in contrast are connected to the Thalmor, that largely obsolete artefact of the province’s governance pre-Empire. The most obvious benefactor from Eranwen’s death is her younger brother, the new Crown Prince, and his advisors in the Thalmor. The relationship between Eranwen and her brothers was cordial but distant, as might be expected from the gap in their ages. There was no hint of discord within the family, despite their varying political inclinations, and since the murder, no evidence has emerged to implicate the Crown Prince in his sister’s death. Morandur, like the rest of his family, seems quite sincere in his grief. I only bring up the possibility of his involvement for the sake of a complete report. I have very little access to the Shimmerene court, but I took the opportunity to present my condolences on behalf of the Direnni, as little welcome as that was. The Shimmerene officials seemed mystified at my presumption – they think very little of us “exiles” – but I was allowed to converse with the younger prince, Andanyon. Our conversation was longer and more informative than I dared hope. I had expected him to be a traditionalist, and I think in many ways, he is, but his view of the larger world is broader than I have been accustomed to meeting among Summerset’s nationalists. I asked him point blank then, ignoring all protocol, what a return to these ancient roots would entail; closing Summerset to the outside world yet again? He shook his head. In conclusion, I did not find out any new information about the murder of the Princess, but I think I am being recruited into the Thalmor. I have stayed non-commital, and will await your opinion on how to proceed. Note in Blades’ Archive, attached to this report. Valiitha Direnni is currently on duty as our agent within the Thalmor, see her dossier for management details. Relevant section pg. 359 of “The Full History of the Blades: Vol. III’ by Esbern of Sky Haven Temple. For two centuries, Valiitha Direnni served as the Blades’ highest-ranking agent within the Thalmor. We know now of course that she became the Thalmor’s mole within the Blades, and was personally responsible for arranging the deaths of most of the victims of the Thirtieth of Frostfall. Reading her reports, it is difficult to pinpoint the moment at which she truly switched sides, but her report on the Crown Princess of Shimmerene’s death demonstrates the early development of her sympathies.